Small group instruction is an important piece of a daily instructional routine so that the teacher is able to reach every learner. Small group instruction enables the teacher to target specific groups of students and specific skills to differentiate instruction and increase student learning. With small group instruction everyone experiences whole group instruction, small group teacher-led instruction, and independent student centers. 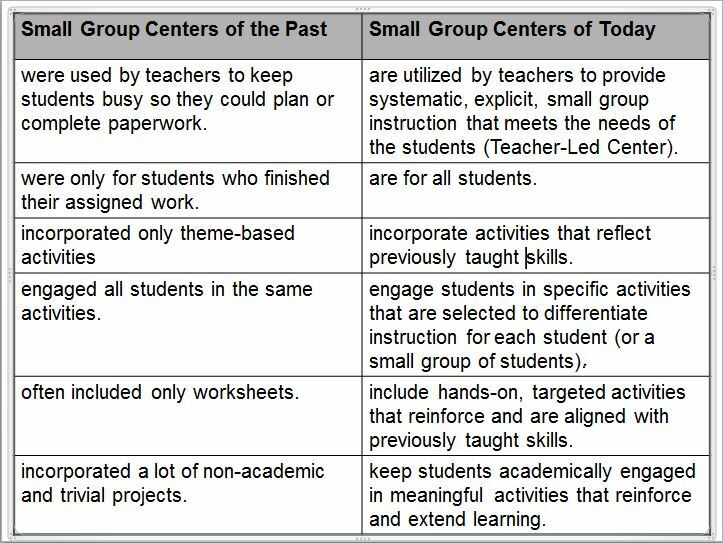 Small group instruction should be flexible, homogeneous, and differentiated. While some small group instruction can be and should be pre-planned, other small group instruction can only be determined “just in time” and “on demand” based on teacher observation. The teacher may pull selected students aside to reteach a skill or objective. But often the teacher will not know who those students are until a particular skill or objective is taught and the teacher is able to identify a deficit. Small goups can pose concerns with classroom management, so it is important for the teacher to set high expectations for small group work.